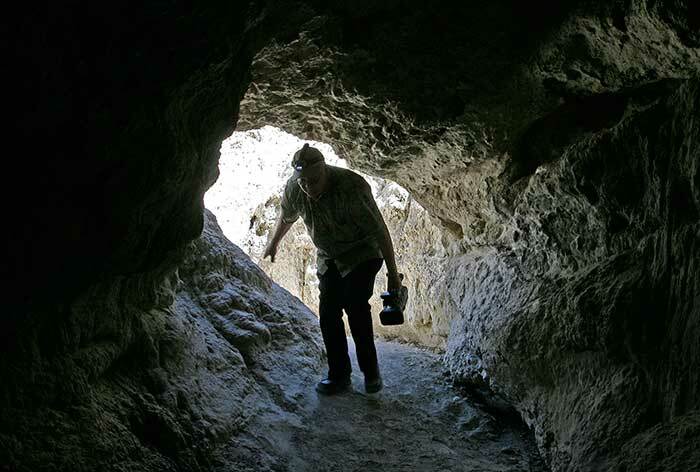 One of the most fascinating points of interest in the Anza-Borrego Desert State Park is the system of caves known as the Arroyo Tapiado Mud Caves. Arroyo Tapiado, translated from Spanish, means “walled wash.” The mud caves are found along the walls of this wash canyon. One of the most extensive mud cave systems in the world, they contain approximately 22 known caves and 9 slot canyons. The length of the caves varies, with some extending over 1000 feet and featuring ceilings as high as 80 feet. 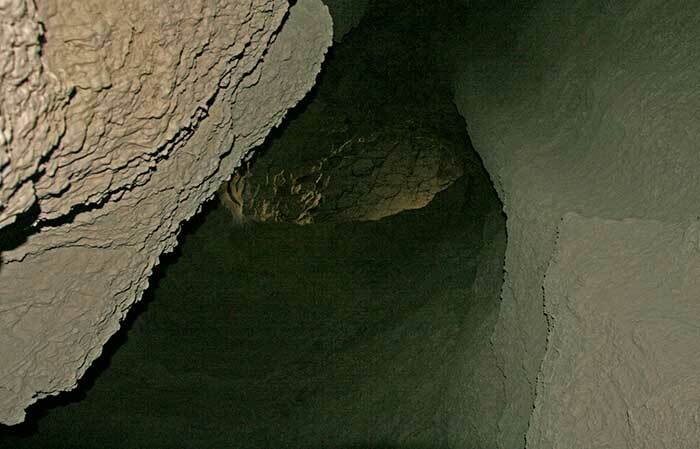 Caves have been reported up to 35 feet wide, while others are so narrow that you have to squeeze through openings. Multi-level caves with skylights have been found, where erosion has created an opening, or sinkhole, in the ceiling of the cave. Some of the caves are fairly easy to navigate while others may require you to crawl in sections. The mud caves are formed by fluvial erosion caused during periods of heavy rainfall. When this infrequent rainfall occurs, it cuts channels into the mud hills that are commonly found in the Pseudokarst topography of this arid region. The channels cause erosion and form canyons with unstable and undercut walls. As the channels deepen, the walls cave in. Because of the cohesive consistency of the mud in this particular area and its ability to swell to several times its original dry volume, it adheres to itself and to the canyon walls, creating natural bridges and, sometimes caves, as it dries. The caves are not as well known as some of the other points of interest in the park -- they are not mentioned on the park’s web site or in its literature. They are popular with spelunking enthusiasts and other desert denizens however. 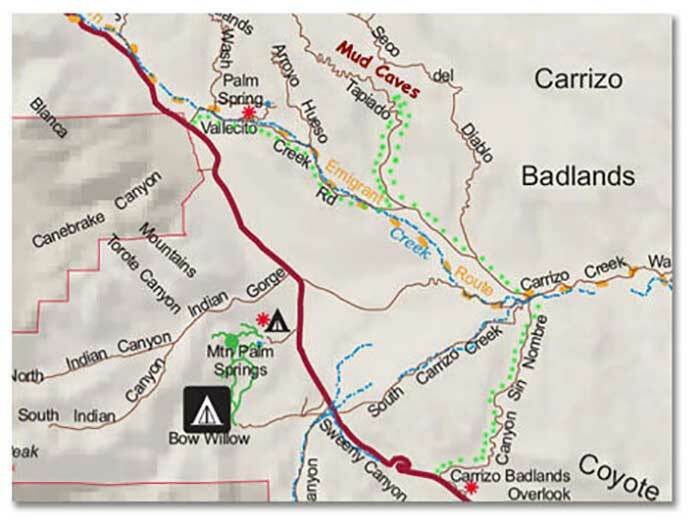 You can find more information on the Arroyo Tapiado Mud Caves in the Anza-Borrego Desert Region Guide. 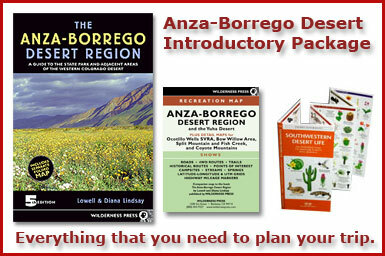 This guide is part of the Anza-Borrego Park Package available in DesertUSA’s online store. The package also includes a detailed park map with the location of the mud caves shown. You can park and walk into Arroyo Tapiado Canyon. There you will begin to see dark holes or cracks in the side of the mud walls that are the entrances to some of the caves. Others can be found by walking into the slot canyons off of the main wash area that runs through the canyon. The caves are not always obvious. You may need to do a little searching and exploring to find hidden entrances and caves that are off the beaten track. If you have 4WD you can continue into the canyon by car and stop where you want to hike into a cave or slot canyon -- there are many along the route. These caves can be dangerous. People have lost their lives here. Never explore by yourself and always carry a light with you. Your phone may or may not have coverage here. Always use caution when exploring caves. You will need to carry several light sources, and water, and it is recommended that you wear a hardhat or helmet. Never enter the caves if it is raining, has rained recently or if rain is expected. Take a caving partner with you when you explore the caves or let someone know exactly where you are going to be and when you will return. Use the buddy system! Do not walk on top of the caves, along the ridges or in areas where the ground may cave in. These hills are made of mud and can be very unstable. 4WD is recommended. Some non-4WD vehicles have driven into the beginning of the canyon, but to drive through the canyon you will need 4WD. 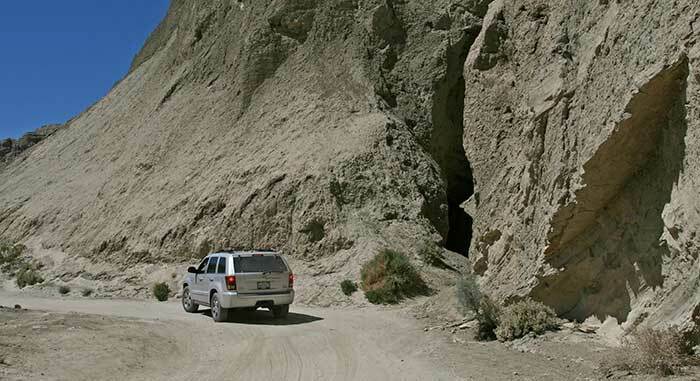 The Arroyo Tapiado Mud Caves are located in the southern part of the Anza-Borrego Desert State Park. Take the S2 (from the 8 head north) to mile marker 43. Take the Palm Springs or Vallecito Wash exit (dirt road heading east). Approximately 4.5 miles in, you will see a sign that says Arroyo Tapiado (on the left). Go left at the Arroyo Tapiado Wash which will be heading north. Continue on Arroyo Tapiado Wash Road until you reach the canyon area where the caves are located. Borrego Badlands - This spectacular area, with its arid rocky geography, sunken mesas and corrugated hills of dry mud, is called the Badlands of Anza Borrego. See the Pumpkin Patch. Fonts Point in Borrego Badlands - Join the crew of DesertUSA and take a trip to Fonts Point in the Borrego Badlands. Font's Point may be the best place in North America to view sediments of the Pliocene and Pleistocene Epochs. Mud Caves Carrizo Badlands - The Mud Caves are found along the walls of Arroyo Tapiado canyon. One of the most extensive mud cave systems in the world, they contain approximately 22 known caves and 9 slot canyons. Bighorn Sheep - Watch a desert bighorn grazing on grasses on a rocky hillside, then gamboling up the hill. Great shots of this beautiful animal against the skies of Anza Borrego. Ocotillo Wells SVRA - Join DesertUSA as we take a look at what draws so many people to this location - almost 2 million people annually. See also the Gas Domes' mud pots and the Pumpkin Patch.